Ever since the democracy manipulation efforts of international hedge fund brigand George Soros were joined with the artificial street revolution tactics of CIA tactician Gene Sharp to form the core strategy of the U.S. neo-conservative goal of imposing a «New American Century» on the entire world, Ukraine has served as the prize of America’s interventionist foreign policy. And the neocons are still alive and active as ever inside Secretary of State John Kerry’s State Department. 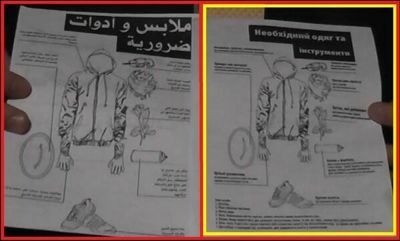 Instructions for protesters on Tahrir and Maidan in Arabic and Ukrainian languages are identical. The source is evidently the same. (Find here the original U.S. colored revolution user manual for Egypt). In the wake of what has been called the «Orange Revolution II»  in Ukraine, Kerry’s Assistant Secretary of State for European and Eurasian Affairs, Victoria Nuland, who previously served as Hillary Clinton’s State Department mouthpiece, threatened sanctions against Ukraine’s government led by President Viktor Yanukovych. Gazing over protesters in central Kyiv from his hotel window, Arizona’s fanatical Republican Senator John McCain was licking his chops over the prospect of an anti-Russian Ukraine coming into being. McCain is a Cold War throwback and someone who remains mentally-unbalanced between flashbacks from a prisoner of war cell in Hanoi and to present-day reality. Ukraine, which resisted efforts by the European Union to integrate it into Europe’s banker-led federation of austerity and poverty, came into the EU’s cross hairs after it abandoned an «Association Agreement» pact with the EU. Instead, Kyiv opted for a more lucrative economic union with Russia. That move triggered off a mass street uprising in Kyiv’s Maidan (Independence) Square that demanded the resignation of Ukraine’s democratically-elected President and government. The connections between the Kyiv uprising and the EU outside manipulators are so apparent, the Kyiv square that has become the «Tahrir Square» of Ukraine is called «Euromaidan.» The initial Tahrir Square uprising in Cairo, which overthrew Egyptian President Hosni Mubarak, was partly manipulated by Soros-financed and Sharp-influenced street demonstrators who took their cues from professional political agitators hastily flown into Egypt from the United States and Europe. 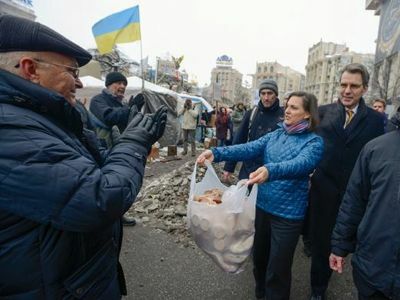 Nuland, who is married to the neocon Robert Kagan, handed out snacks to protesters on Maidan Square. Imagine the reaction of the United States had a second-tier official of either the Russian or Chinese foreign ministry handed out food to Occupy Wall Street protesters in Washington and urged them to overthrow, by force if necessary, President Obama. Yet, that is exactly the scenario Nuland engaged in by supporting protesters in Maidan. Furthermore, she reprimanded Yanokovych for the heavy security presence in Maidan. Nuland and Kerry, who also upbraided Yanukovych, forgot the acts of police brutality committed by U.S. cops against occupy protesters, as well as a plan by the FBI to use snipers to assassinate the leaders of the group. Assistant Secretary of State Victoria Nuland dispensing biscuits to Euromaidan protesters in Kiev. And Nuland and Kerry were very quiet when the Turkish government set loose riot police on peaceful protesters in Taksim Square in Istanbul earlier this year. After all, Turkey is a member of NATO and Ukraine, for the time being, is not. For Gene Sharp and his two NGO «babies,» OTPOR and the Center for Applied Nonviolent Action and Strategies (CANVAS), vanguard organizations for organizing «rent-a-riot» anti-government protests around the globe, only nations resistant to the «New World Order» designs of Wall Street and the Pentagon are fair game for receiving cash, pamphlets, i-Pads and i-Phones, snacks, «themed revolution» placards and banners, restored national flags from times past, and other propaganda support . Recently, it was discovered, through leaked emails, that CANVAS founder Srdja Popovic was collaborating with the CIA- and Pentagon-linked intelligence firm STRATFOR, founded by George Friedman, whose ties to the U.S. and Israeli military-intelligence establishments are well known . The «Orange Revolution II» in Kyiv has also received favorable press in central and eastern Europe and other parts of the world thanks to the auspices of various Soros press entities, including the Center for Advanced Media in Prague, a contrivance of the Media Development Loan Fund, a project of Soros’ Open Society Institute. And as with all fake «themed» revolutions, an «embattled martyr» is needed to rally the «rent-a-mob» to action. For the Ukrainian demonstrator, the «Maiden of Maidan» is Yulia Tymoshenko, the former Prime Minister who was imprisoned for corruption. Tymoshenko, who is now held at a clinic in Kharkiv, has become the «Aung San Suu Kyi» of Ukraine. But for many Ukrainians, the former Prime Minister is a shameless attention seeker whose trademark braided hair coif is derided by many Ukrainians as a «bagel» on top of her head. For Orange Revolution II, the new «heroes» are ex-boxer and UDAR opposition leader Vitali Klitschko and far-right nationalist Oleh Tyahnybok. Their playbooks are written in Soros boiler shops in Prague, London, Washington, and New York and not in Kyiv. In the first round of themed revolutions sponsored by Soros and his U.S. government collaborators and adhering to the Gene Sharp playbook, New World Order template governments were installed in Ukraine and Georgia. Headed by Viktor Yushchenko and Prime Minister Tymoshenko in Ukraine and Mikheil Saakashvili in Georgia, the pro-NATO and EU governments, installed amid a flurry of «pro-democracy» fanfare, soon descended into corrupt and nepotistic regimes. Tymoshenko and Saakashvili soon were associated with the mafia and corrupt business moguls. Tymoshenko’s one-time business partner, former Ukrainian Prime Minister Pavlo Lazarenko, began serving a prison term in California for money laundering, corruption, and fraud. Meanwhile, Saakashvili became entangled with the mysterious «Golden Fleece» charity in Cyprus. Now, «Responsibility to Protect» interventionists in the Obama administration are trying to turn back the calendar to 2004 and bring about another non-democratic ouster of an elected government in Ukraine. Across Ukraine, Moldova, Russia, Belarus, Romania, and other countries of eastern and central Europe, the new generation of Soros agitators and provocateurs are trying to launch another series of «themed revolutions.» This time the goal is, once again, prying Ukraine away from Russia and into the EU and NATO. « Washington et Moscou se livrent bataille en Ukraine », par Emilia Nazarenko et la rédaction, Réseau Voltaire, 1er novembre 2004. “Ukraine: The Street Against the People”, by Thierry Meyssan, Voltaire Network, 29 November 2004. “The U.S. colored revolution user manual for Egypt”, Voltaire Network, 2 March 2011. “The Albert Einstein Institution: non-violence according to the CIA”, by Thierry Meyssan, Voltaire Network, 4 January 2005. “Otpor! leader was working for Stratfor”, Translation Alizée Ville, Voltaire Network, 5 December 2013. Read also : « La biographie cachée du père du président ukrainien », Réseau Voltaire, 18 avril 2008.